Asia: An Oasis of Opportunities. First Row (from left to right): Dato’ John Chong, Chief Executive Officer, Maybank Kim Eng Group; Datuk Abdul Farid Alias, Group President and Chief Executive Officer, Maybank Group; Datuk Mohaiyani Shamsudin, Chairman of Maybank Group; Dato’ Muzaffar Hisham, Group Head, Global Banking, Maybank Group; Ami Moris, Chief Operating Officer, Maybank Kim Eng Group. Second Row (from left to right): Jean-Louis Lee, Deputy Regional Head, Institutional Sales, MKE Group, and Chief Executive Officer, Maybank Kim Eng Securities USA Inc; Lucy Chong, Regional Head, ASEAN Sales and Regional Head, Corporate Access, Institutional, Maybank Kim Eng Group; Jeffrey Goh, Regional Head, Equities, Maybank Kim Eng Group. Third Row (from left to right): Patrick Han, Chief Executive Officer, Maybank Kim Eng Securities UK; Alexander Panasko — Regional Head, International Business, Maybank Kim Eng Group. 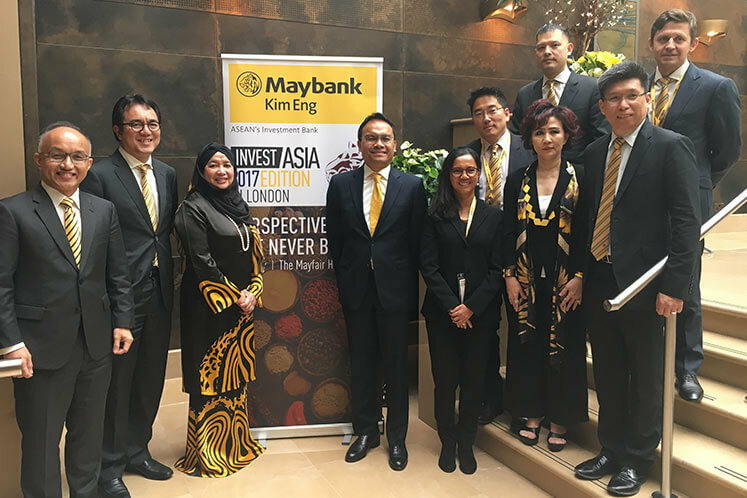 KUALA LUMPUR (May 11): Malayan Banking Bhd's (Maybank) senior management at the group’s flagship investor conference in London last week. Invest Asia UK was held at the May Fair Hotel London on May 4 and 5, which attracted more than 300 delegates from 23 countries, 31 corporates from 12 countries in Asia, including China, South Korea, Taiwan, India, Malaysia, Thailand, Indonesia, the Philippines and Pakistan. The corporates cover North Asia and Asean, with a total market capitalisation of about US$500 billion and 120 funds across Europe, totaling US$19 trillion in assets under management.